Here is the one thing I love and hate about the holidays: candy, sweets, treats. I love to eat them, but I hate to try and fit into my jeans a few weeks later. 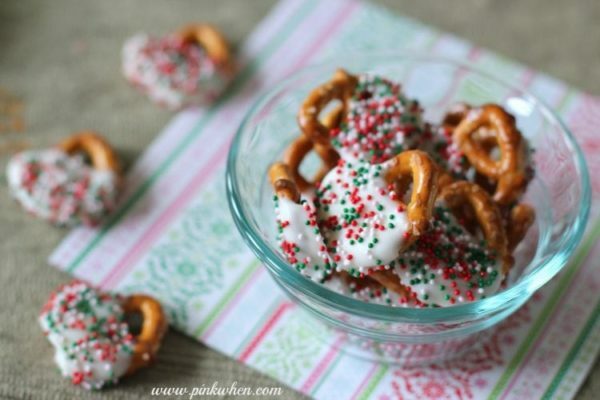 I mean, how could you pass up a bowl full of these Christmas Candy Pretzel Treats? I find it unavoidable and most certainly cannot stop myself. I have the worst will power during the holidays. It depresses me. Step 1: Add your candy melts to a microwaveable safe bowl and the vegetable oil and heat on high in the microwave for 1 minute. Remove and stir. Place back in the microwave and heat on 30 seconds, remove and stir, and continue this cycle until the candy melts are fully melted. Usually about 1.5 minutes. Step 2: Place a large sheet of wax paper on a cookie sheet. Step 3: Dip your pretzels, one at a time, in the melted chocolate candy. Place on the wax paper. Do this for all of the pretzels you would like to make. Step 4: Once you have your candy coated pretzels on the wax paper, open up the sprinkles and cover your coated pretzels. Step 5: Allow to fully harden before storing in a candy dish or gift bag, about 30 minutes. I think this awesome treat takes all of 10 minutes to make from start to finish. It’s so easy, and I promise you they are a yummy sweet treat. I love the salty pretzel and sweet tastes all mixed together. Make some of these Christmas Candy Pretzel Treats when you are invited to a party, or just for fun around the house. Everyone will love you! This simple pretzel snack is perfect for any potluck or Christmas party snack. It's easy, fun, and delicious! Add the candy melts and vegetable oil to a microwaveable safe bowl and melt as directed. Place wax paper on a cookie sheet. 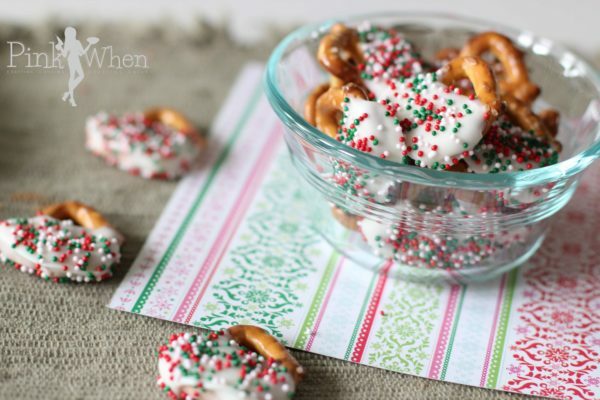 Dip pretzels into melted candy and place on wax paper. Add sprinkles. Allow cooling completely before storing them in an airtight container. These look absolutely wonderful! Pinning! Thank you so much for the Advent post and for this recipe. With two teenagers and all the friends coming and going nonstop this is a perfect snack for me to make for them. Exactly what I needed. So easy to make but looks so festive! Thank you 🙂 They are SOOOO delicious, too!